Apparently, we have a new theme. 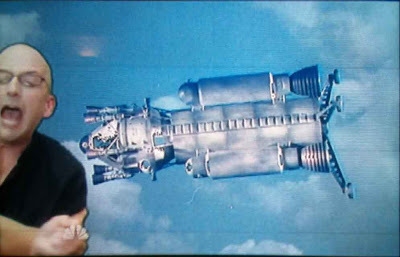 It's "footage of 1970's TV spaceships that ends up in karaoke videos on new programs." Last week's episode of Community featured scenes of Joel McHale as Jeff Winger and Jim Rash as Dean Pelton (that's him on the left screaming) making karaoke videos in the mall. They break into a fight as another video starts rolling behind them, and there once again appears the Salvage 1 spaceship on network screens for the second time in thirty years. (See the last entry if you're confused at this point). Is this a new trend in television? Or the last time it'll ever happen? How odd.